In 2006, I started teaching a graphic design theory class at the Maryland Institute College of Art. I soon found that there was no textbook for such a class. Ellen Lupton suggested that I solve this problem myself. My thesis project, Graphic Design Theory: Readings from the Field, (Princeton Architectural Press, 2009) sprang from that conversation. 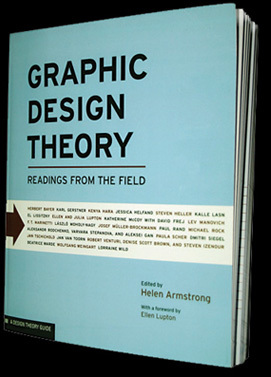 Graphic designers often look to other discourses, like architecture, to establish a strong theoretical base for their field. Through this book I hope to redirect such theoretical quests back toward our own texts. Designers have written about the ideas behind their work since the very beginnings of the profession. Through the words of El Lissitzky, Herbert Bayer, Beatrice Warde, Karl Gerstner, Lorraine Wild, Jessica Helfand, Kenya Hara and more we can understand the ideas that continue to shape our own work. And, even more importantly, we can look to the future of the profession. Issues like authorship, universality and social responsibility that were so essential to the beginning of the last century are once again moving front and center in our society.